kunstgarten | Wolfgang Volz / Christo and Jeanne-Claude: DESIGNED LANDSCAPE. Wolfgang Volz / Christo and Jeanne-Claude: DESIGNED LANDSCAPE. The installation of The Gates in New York’s Central Park was completed in February 2005. 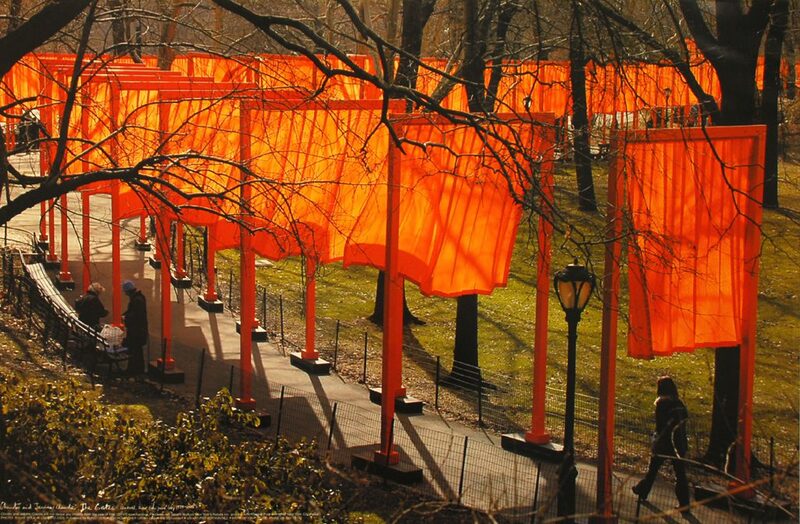 The 7,503 gates with their free-hanging saffron colored fabric panels seemed like a golden river appearing and disappearing through the bare branches of the trees. The installation in Central Park was completed with the blooming of the 7,503 fabric panels on February 12, 2005. The 7,503 gates were 16 feet (4.87 meters) tall and varied in width from 5 feet 6 inches to 18 feet (1.68 to 5.48 meters) according to the 25 different widths of walkways, on 23 miles (37 kilometers) of walkways in Central Park. Free-hanging saffron colored fabric panels, suspended from the horizontal top part of the gates, came down to approximately 7 feet (2.13 meters) above the ground. The gates were spaced at 12 feet (3.65 meter) intervals, except where low branches extended above the walkways. The gates and the fabric panels could be seen from far away through the leafless branches of the trees. The work of art remained for 16 days, then the gates were removed and the materials recycled. The 5 inch (12.7 cm) square vertical and horizontal poles were extruded in 60 miles (96.5 km) of saffron colored vinyl. The vertical poles were secured by 15,006 narrow steel base footings, 613 to 837 pounds (278 to 380 kilograms) each, positioned on the paved surfaces. No holes were made in the ground. The gates’ components were fabricated, off-site, by seven manufacturers located on the East Coast of the USA. The weaving and sewing of the fabric panels was done in Germany. In teams of eight, 600 workers wearing The Gates uniforms, were responsible for installing 100 gates per team. The monitoring and removal teams included an additional 300 uniformed workers. The monitors assisted the public and gave information. All workers were financially compensated and received breakfast and one hot meal a day. Professional security worked in the park after dark. The Gates was entirely financed by Christo and Jeanne-Claude, as they have done for all their previous projects. The artists do not accept sponsorship or donations. The grid pattern of the city blocks surrounding Central Park was reflected in the rectangular structure of the commanding saffron colored poles while the serpentine design of the walkways and the organic forms of the bare branches of the trees were mirrored in the continuously changing rounded and sensual movements of the free-flowing fabric panels in the wind. The people of New York continued to use the park as usual. For those who walked through The Gates, the saffron colored fabric was a golden ceiling creating warm shadows. When seen from the buildings surrounding Central Park, The Gates seemed like a golden river appearing and disappearing through the bare branches of the trees and highlighting the shape of the meandering footpaths.